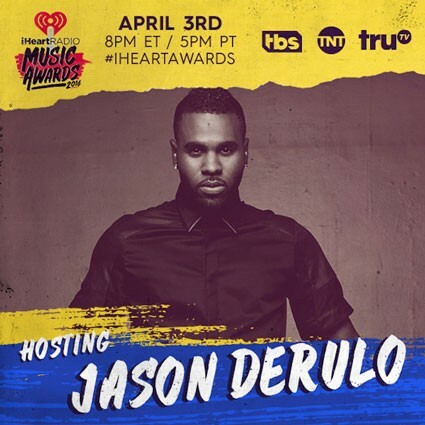 Jason Derulo will be hosting this year’s iHeartRadio Music Awards set to be held on Sunday, April 3rd. The 2016 iHeartRadio Music Awards will be broadcast live on TBS, TNT and TRUTV beginning at 8pm ET/5pm PT, and will feature performances by newly announced performers Zayn, Chris Brown, DNCE, Fetty Wap and Demi Lovato. Also confirmed to perform are Justin Bieber and Meghan Trainor, with Pitbull and Maroon 5’s performances from the Capital One JamFest® featured during the awards broadcast. Topping the list of the 2016 nominees are Taylor Swift with eight and The Weeknd with seven nominations. Adele, Drake, Justin Bieber, Ed Sheeran, Luke Bryan and Sam Smith also picked up multiple nominations.